Amazing as a plugin, but pair it with an Apollo and the Unison functionality makes this the absolute greatest EQ/preamp recording combination in computer music. Unison technology is amazing. Stunningly vital, clear and focused sound. Powerful, terrific tone-shaping EQ. Realistic analogue clipping. Impedance switching. Unison system is Apollo-only. Massive DSP hit! 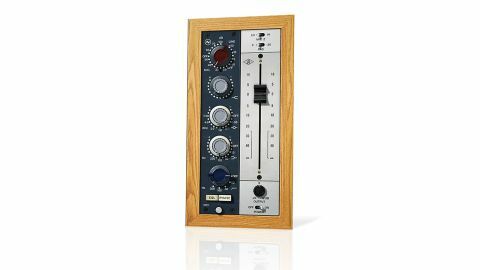 The Neve 1073 was one of the first EQs to be modelled by Universal Audio for its Powered Plug-Ins range many years ago, but due to the technological limitations of the time, it didn't capture all the non-linear characteristics that give the original its gorgeous sound. This earlier, less DSP-intensive version is included in the new Neve 1073 Preamp & EQ Plug-In Collection as the 1073 Legacy plugin, as is the even more DSP-friendly 1073SE Legacy version. "It not only emulates all the circuit interactions of the hardware, but also the preamp characteristics when used with an Apollo audio interface"
The headliner in this latest Plug-In Collection for UAD-2 platforms (VST/AU/RTAS), then, is simply called 1073. It not only emulates all the circuit interactions of the hardware version (including all ten of its clipping points), but also the preamp characteristics when used with one of Universal Audio's Apollo audio interfaces. The implementation of Unison technology allows you to insert it into the dedicated preamp slot on the UAD Console software that comes with all Apollo interfaces, integrating said preamp characteristics with the actual input stage of the Apollo, including mic/line input select, mic and line gain, high or low impedance, 20dB pad, fader level and output gain. What this amounts to is the extremely exciting ability to use the Apollo/plugin combo as a recording/monitoring input stage, exactly as you would the real thing. It works beautifully, too, and with other Unison-enabled plugins (the API Vision Channel Strip and UA 610), the versatility of the system is beginning to be realised. The only 1073 input feature not present on the Unison version is the switchable 300/1200 Ohm mic impedance. UA's new 1073 sounds absolutely stunning. The Apollo's own preamps sound good as they are, but insert the 1073 and the difference is night and day. "Audio recorded through it comes at you with a definition and solidity that you can almost reach out and feel"
Audio recorded through it comes at you with a definition and solidity that you can almost reach out and feel - if you're not already a believer in the theory that the quality of the preamp is as important as that of the mic it's connected to, this will leave you in no doubt. And all of this is before you've touched the drive levels and the high/low impedance switch. The new EQ algorithms better portray the tasty non-linearities of the real thing. The air of the 12kHz shelving band is there, as is the extreme but smooth nature of the mid-range bell band, with its distinct colouration. The low shelving band is a coarse control that works to add or subtract weight at 35, 60, 110 or 220Hz, while the passive high-pass filter shaves off bottom-end at 18dB/octave from a 50, 80, 160 or 300Hz rolloff point. The long-throw output fader adds colour- useful for a bit of overdrive. One caveat is the enormous DSP demands of the new 1073, consuming 40% of a single UAD DSP chip per mono instance, and 67.6% for a stereo one. If you're recording through it as a Unison input stage, it's not so bad, as you only need to record through it once. But if you intend to mix with the plugin in your DAW, when using, say, a UAD-2 Duo unit, you'll only be able to run 4 mono or 2 stereo instances (though the EQ section can be disabled to reduce DSP usage). This new 1073 is a huge step up from the original UAD model, and not just because it simply sounds better, but also for the inclusion of the Apollo input preamp stage, which really is a potential game-changer. The range of analogue colours it paints is vast, and its sonic clarity and depth are fabulous.